Booyah Silvertowne Auction! for noting rim dings and the advisory to bid accordingly. We appreciate your numismatic skill and integrity. Boo! 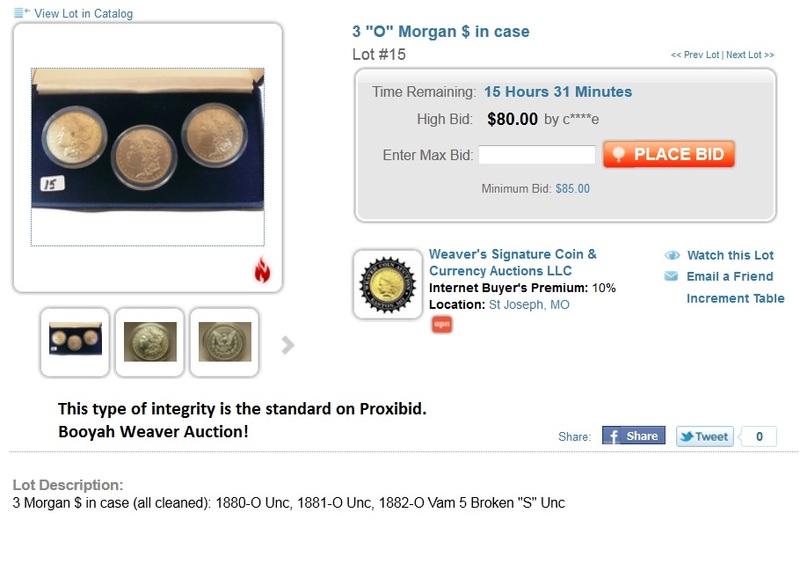 to this unnamed auction house for mistaking a brass souvenir token for California fractional gold. Beware of bears. Some are gold (about $10-15 dollars worth) but most often are plated. If you see a bear and not a denomination, you can bet your token is a trinket. Boo! 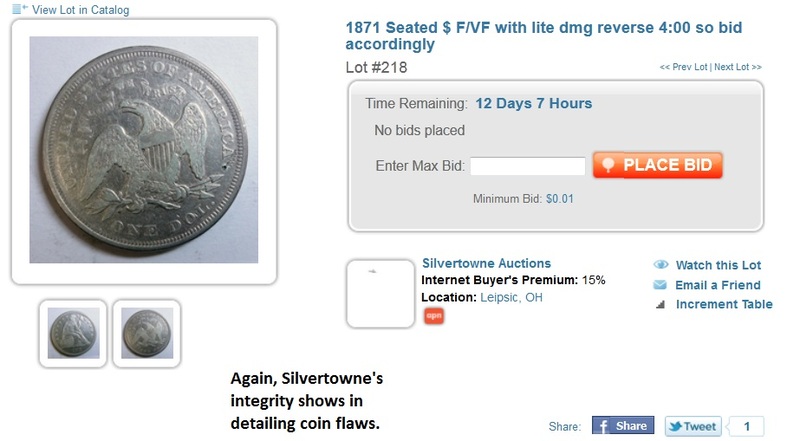 to this unnamed auction house that doesn’t note scratches on the coin but that are plainly visible when the photo is expanded. Boo! 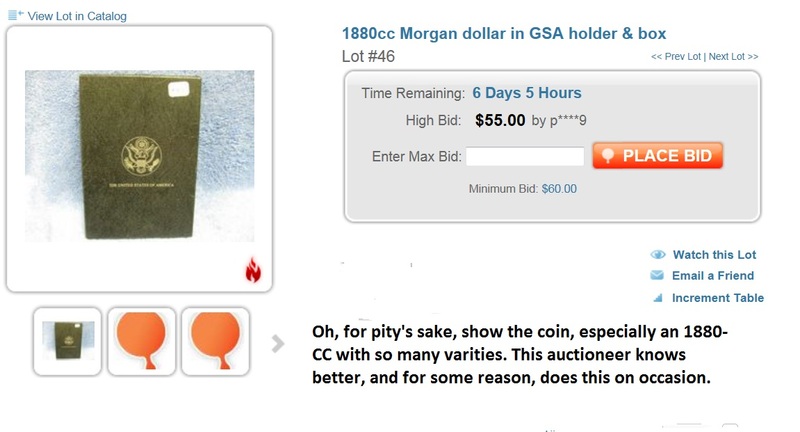 to this unnamed but knowledgeable auctioneer who only shows the box of a GSA 1880-CC dollar, which has multiple varieties. This house has great consignments but continues to take occasional shortcuts on photos. 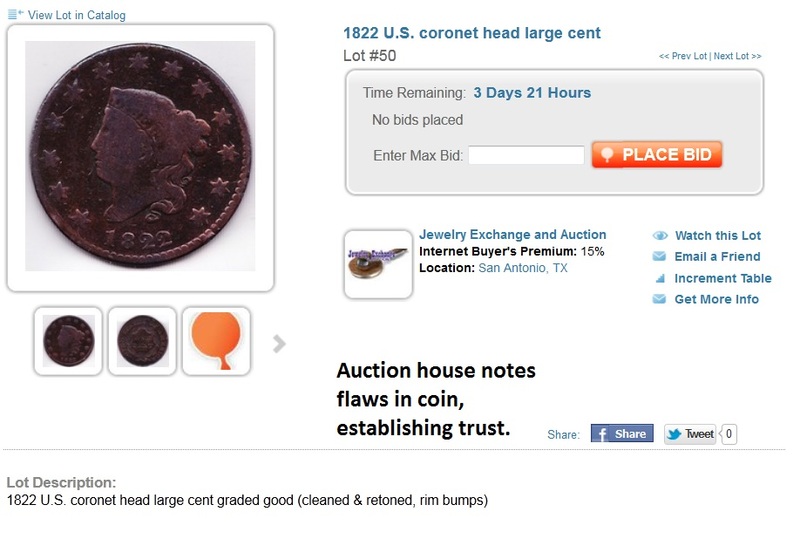 Nothing is more important than good photos of obverse and reverse if you hope to get ever higher bids on Internet. 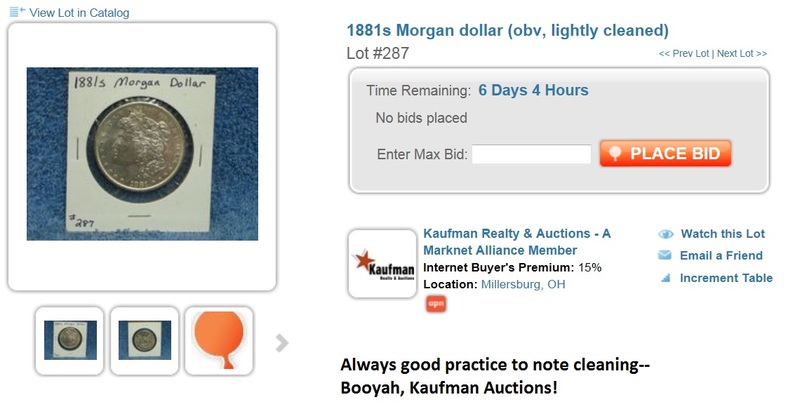 Booyah Kaufman Auctioneering! for noting cleaning, one of those flaws that often digital photography cannot capture. By noting cleaning, you ensure proper bids and avoid hassles of complaint afterward. Boo! to this unnamed auction house that hypes a consignor’s MS64 as gem-plus (MS66). We see too much of this. 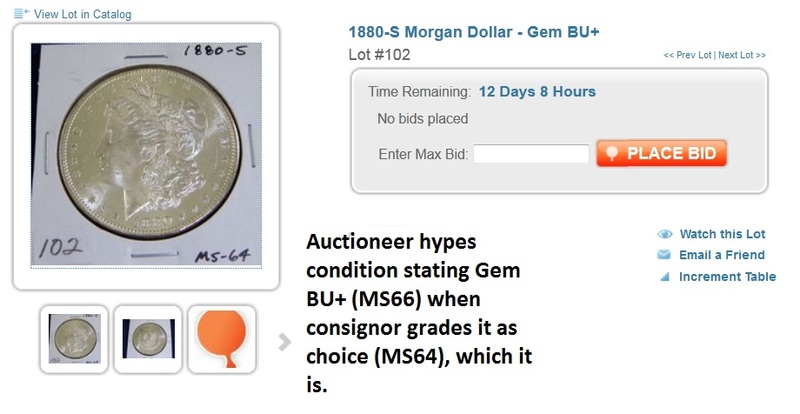 Check out this article to learn what is and what is not a “gem” coin. Booyah Jewelry Exchange! 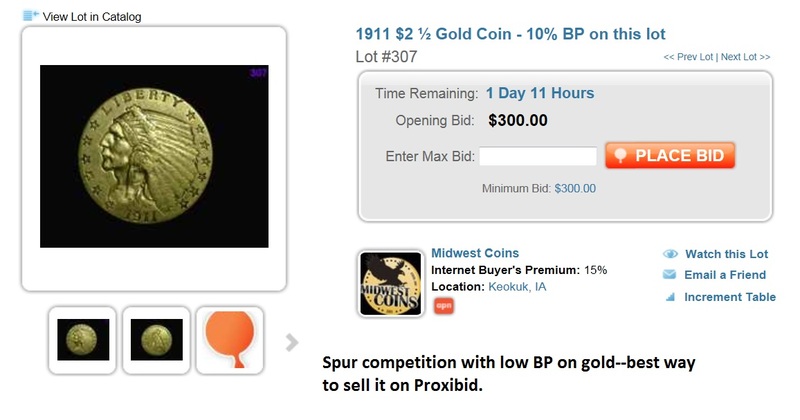 for noting several flaws in this coin that are not readily apparent in the photograph, once again establishing trust that brings return coin buyers to a particular house’s auctions on Proxibid. Booyah Midwest Coins! for lowering the buyer’s fee on gold, the best way to stimulate competition and make a strong sale. 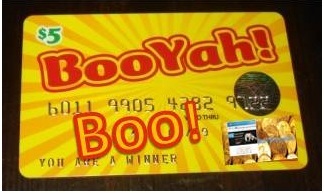 Booyah Shamrock Auction Service! 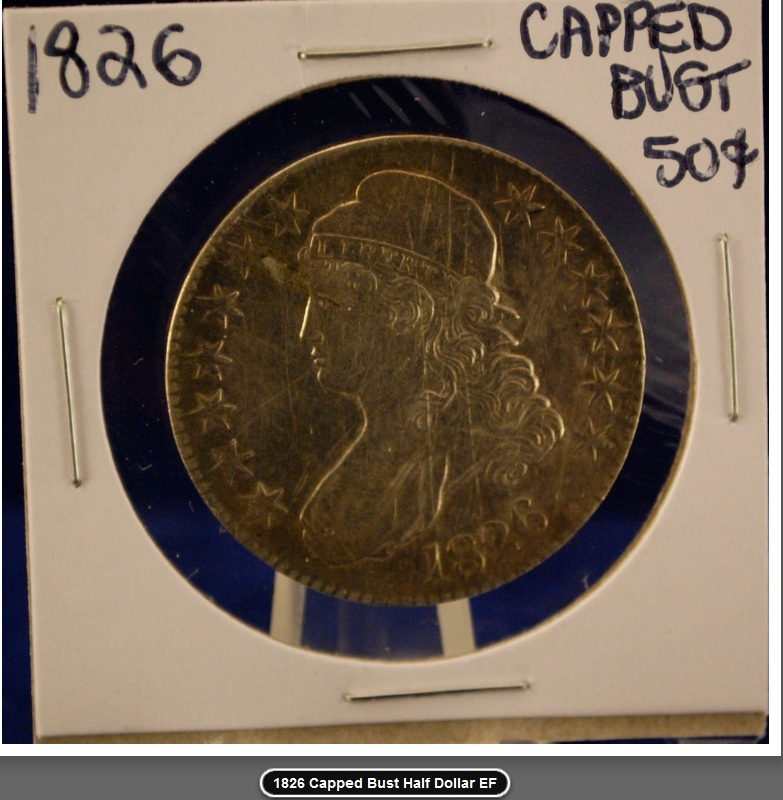 for noting damage to a coin, the kind again that might be overlooked in the typical digital photograph, establishing standards for this house and ensuring return customers. A very small Boo! 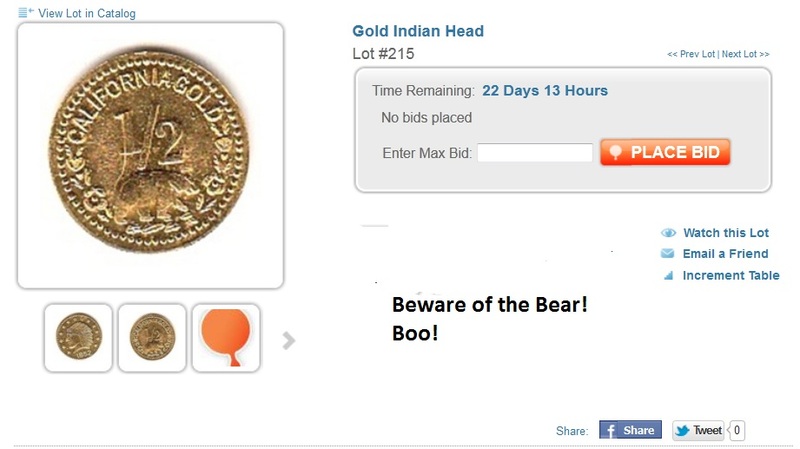 to this unnamed auction house that makes a typo in the description of a gold coin. 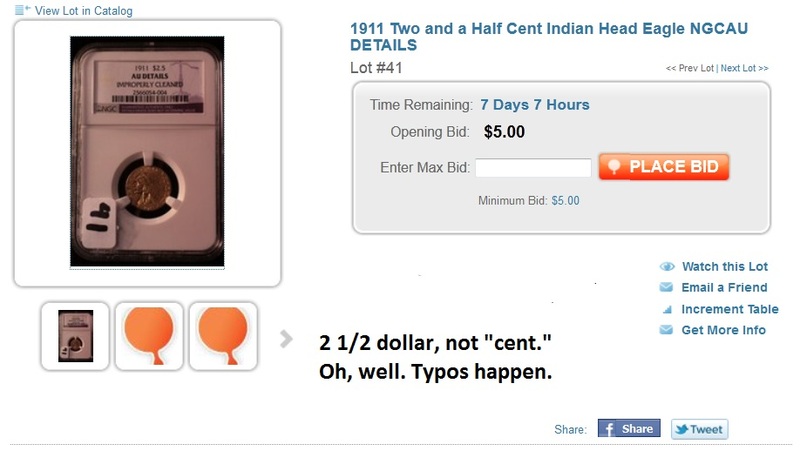 Typos can cost, especially when you mistake a gold coin for a copper cent! 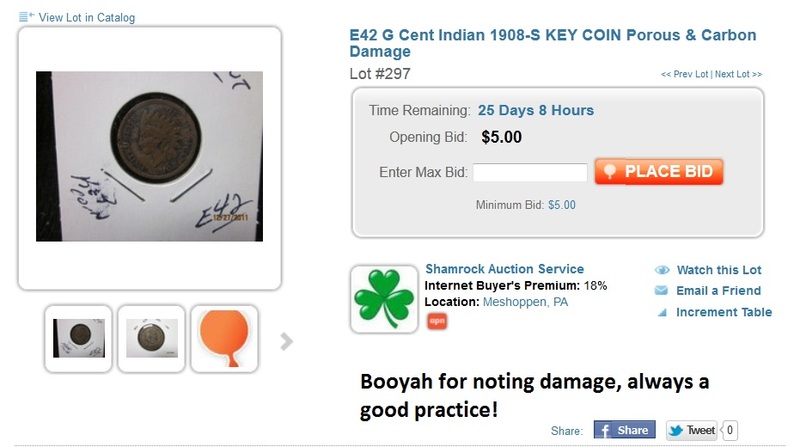 This entry was posted in Best Practices, Featured Updates and tagged Jewelkry Exchange, Krause Auctioneering, Midwest Coins, Shamrock Auction Service, Weaver Signature Coin Auction. Bookmark the permalink.